INDIANAPOLIS – (February 23, 2016) – Students at three Indianapolis high schools were recently visited by former NFL player and motivational speaker, CL “Shep” Shepherd, who shared the struggles of his upbringing and how his decision to “go against the flow” led him to seek a life of success rather than a life of violence. Shep’s powerful and unabashed testimony proved that no matter your environment, “you make the decision to succeed”, which moved students to join him on stage and proudly demonstrate their commitment to elevate themselves. Shep wrapped up the five-city Elevate Tour, sponsored by Herff Jones and parent company, Varsity Brands, in Indianapolis. By using real life experiences, Shep motivates students to elevate themselves by working hard in the class room and on the field, accepting leadership opportunities in the school and community, and surrounding themselves by other positive people. “By far the most inspirational, real, relevant, and engaging event I have ever been a part of in my 13 years of working in education, or prior when I worked in the business world! It’s amazing that Shep was able to have an immediate impact on our school community! We appreciate and value his message!” said Franklyn Bush, Freshmen School Principal at Lawrence North High School. 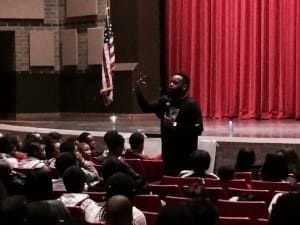 Shep is a nationally recognized mentor and motivational speaker. Growing up in poverty, Shep’s mother had to work long hours to support 15 children. His environment sent him into an abyss of hatred for the world and into the arms of gang life. Shep has endured challenges that most would only encounter through movies or television. In high school, Shepherd turned his life around and become involved in football, which earned him a scholarship to Florida Atlantic University. After graduating, he played in the NFL for the Tampa Bay Buccaneers and the Detroit Lions. As a result, his transparent message captivates and leads people to transform their lives, just as he did. Shep spoke to freshmen at Lawrence North High School and Lawrence Central High School on February 9, and Pike High School on February 10. After each presentation, Herff Jones and Varsity Brands provided educators a series of lesson plans they may use in the classroom to reinforce the “elevate” message. The focal points are to assist students with short and long-term goal planning, create a plan for self-improvement, and design a way to promote school activities and give back to the community. Many students approached the speaker after the presentation to share their own challenges, “Students were sharing personal situations and admitting to Shep that their lives were changed for the better after hearing him speak that day,” said Ransome Harper, National Director at Varsity Spirit. Indianapolis-based Herff Jones is the leading provider of graduation and educational products and services designed to inspire achievement and create memorable experiences for young people. A division of Varsity Brands, Herff Jones’ products include class rings and jewelry, caps and gowns, yearbooks, and motivation and recognition programs. Focused on building long-term relationships through a nationwide network of over 2,000 employees, the professionals at Herff Jones have been helping elevate the student experience and celebrate academic milestones for nearly 100 years. For more information about Herff Jones or Varsity Brands, please visit www.herffjones.com or www.varsitybrands.com.